Where artisanal comfort food meets craft beer. Enjoy plates made to order in our scratch kitchen, featuring locally sourced ingredients, and pair the flavors of each season with Rapscallion’s own craft beers or select wines and cocktails. Settle inside our historic farmhouse and enjoy a meal at our cozy bar, by one of our hearths, or al fresco on our patio. Drink beer, do good. 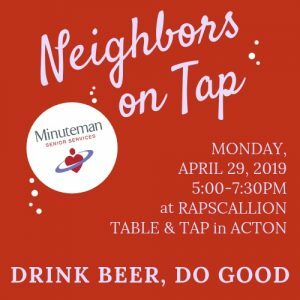 Join Minuteman Senior Services for this fundraising event! Proceeds will support Meals on Wheels, senior dining centers, and other programs that help older adults to age-in-place.